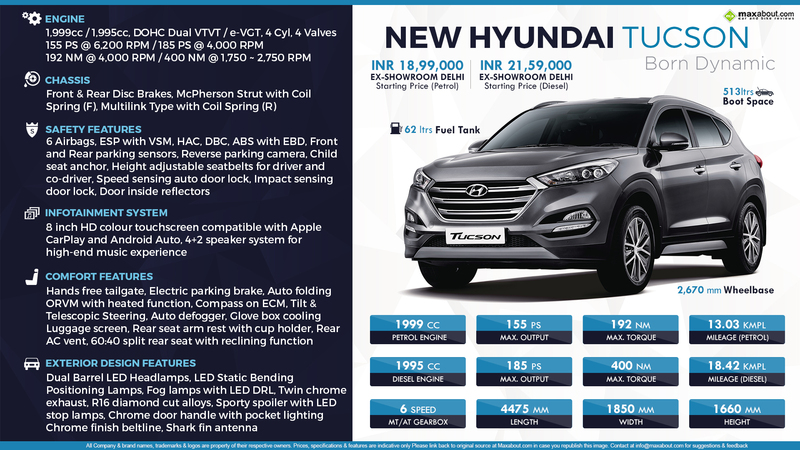 2016 Hyundai Tucson was recently launched with a starting price tag of INR 18.99 lakh and claims INR 24.99 lakh for its most loaded diesel trim. The car perfectly fills the empty slot between Creta and Santa Fe in the Hyundai lineup. It is powered by an all new diesel engine while the petrol motor used on the same is the one being used on Indian Hyundai Elantra. The car rivals Mahindra XUV500 and Toyota Innova Crysta indirectly. The 1995 cc, e-VGT 4-cylinder diesel motor is good for 185 PS at 4000 rpm and 400 Nm of torque at 1750-2750 rpm. The other one is the 1999 cc, 4-cylinder dual VTVT petrol motor producing 155 PS at 6200 rpm and 192 Nm at 4000 rpm. Both these engines are mated to 6-speed automatic and manual gearbox options. The diesel car is actually more powerful than the petrol motor, making it the ideal choice of Indian buyers with its fuel efficient approach. Not just that, the car beings premium features within a compact design, making it even more efficient on traffic filled Indian cities. The diesel MT and AT Tucson is good for 18.42 kmpl and 16.38 kmpl respectively while the petrol returns 13.03 kmpl and 12.95 kmpl for MT and AT respectively. The car comes loaded with features like double barrel projector headlights, 16 inch diamond cut wheels, 10 way power adjustable driver seat, 6 airbags, front and rear parking sensors, electronic stability control, dynamic brake control and 8 inch infotainment system with Apple CarPlay and Android Auto.